The latest installment in our “Staff Engage the Arts” series was written by Keren Baldwin, CCAA Operations Manager. 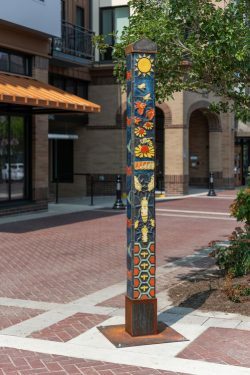 Ever walk by outdoor sculptures and wonder what is the story behind them, or the artist’s inspiration or concept? Recently I had the opportunity to attend “Unveil Your Art” sponsored by the Arts Council of Lake Oswego. 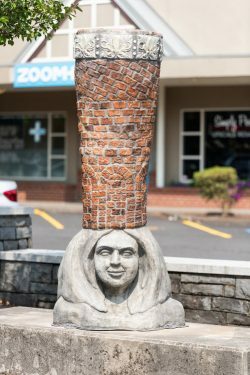 The event was in celebration of the 15 new sculptures adorning the streets of Lake Oswego. 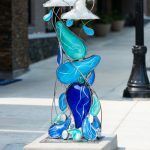 The sculpture artists were invited to come and share about their newest pieces installed in Lake Oswego’s Gallery Without Walls outdoor sculpture exhibit. It was amazing to hear about the inspiration behind specific pieces such as Vicki Wilson’s Fortress, a tribute to the strength of her sister. Along with some of the more technical processes used with glass shaping in Sharon Agnor’s Living Water 2. It was especially meaningful to take the walking tours with the artists standing near their sculptures sharing and having the opportunity to listen and ask questions. 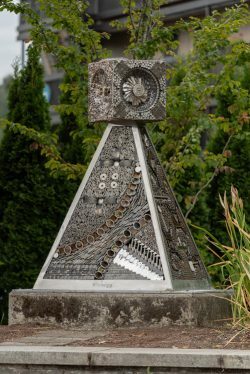 I enjoyed understanding the processes used in clay with Gregory Fields’ Pollinators, and from Wayne Kangas as he described the steel welding process and the meaning of the symbols used in creating Beacon. There is such a variety of medium and subject matter used in these sculptures, it expanded the boundaries of possibility and I came away inspired! Interested in taking a walking tour of the 15 new Gallery Without Walls pieces? CLICK HERE to download the brochure. This post is part of our series, featuring Clackamas County Arts Alliance staff members engaging with local arts and culture. Let us know what you think – Email [email protected] with any comments. Sharon Agnor "Living Water 2"
Photos courtesy of the Arts Council of Lake Oswego. 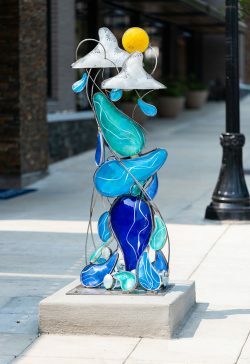 For the full list of sculptures, please visit their website: http://artscouncillo.org/gallery-without-walls/tour/. I read this article and found it very interesting, thought it might be something for you. The article is called Staff Engage the Arts: Keren Visits Unveil Your Art and is located at https://clackamasartsalliance.org/news/staff-engage-the-arts-keren-visits-unveil-your-art/.